When acidic materials are spilled, the clean-up procedure involves adding a base chemical to neutralize the acid. Up to a point, the more base added, the more neutral and less toxic the spill becomes. Something very similar is happening in the atmosphere. Acidic sulfur emissions from power plants have been rapidly declining over the past decade, and the neutralizing base - ammonia - is emitted from a different source, and has not declined. This has led many atmospheric scientists to assume that the ambient sulfate particles we all breathe are becoming less acidic and therefore less toxic. But a new study shows this intuitive expectation hasn't happened, at least not in the Southeast United States, where the remaining sulfate particles appear to be as acidic as ever. Though they were surprised by the findings, researchers at the Georgia Institute of Technology have developed an explanation that may also ease concerns about yet another atmospheric pollutant that scientists had feared would take the place of the reduced sulfates. Beyond human health, the research has broader implications for atmospheric pollution and global climate change modeling. Sponsored by the National Science Foundation and the U.S. Environmental Protection Agency, the research will be reported February 22 in the journal Nature Geoscience. The conclusions are based on observed gas and aerosol composition, humidity and temperature data collected at a site in rural Alabama as part of the Southern Oxidant and Aerosol Study (SOAS). "Sulfates are the major source of acidity in the atmosphere, and gas-phase ammonia - mostly from agriculture - had been expected to react with the remaining particles to reduce their acidity," explained Rodney Weber, a professor in Georgia Tech's School of Earth & Atmospheric Sciences. "But what we found is that the system that forms the sulfate particles isn't very sensitive to the amounts of ammonia neutralizer. This has implications because the acidity of these particles affects other important atmospheric reactions." Instead of reacting with all of the available acidic sulfates, the alkaline ammonia emitted from agricultural operations and other sources appears to form an equilibrium between gas-phase compounds and particle compounds. These ammonia emissions, though seasonal, have remained largely unchanged. With the same amount of neutralizing ammonia available to react with a much smaller amount of sulfates, scientists had expected the pH of the sulfate fine particles to rise toward neutral levels. But the pH remains between 0 and 2 - approximately the same level of acidity as battery acid. "Sulfates stay in the particle phase and are not volatile," said Weber, who is the paper's first author. "Ammonia likes to volatilize and, in part, stay in the gas phase. This means that it is very difficult for it to fully neutralize the acidic particles, which explains why the system tends to be insensitive to the amounts of neutralizer available." Particles smaller than 2.5 microns in diameter - known as PM 2.5 - have human health implications because they can travel deep into the lungs to cause respiratory and cardiovascular problems. Because of their potential health impacts, production of the sulfur compounds that form these particles has been reduced by more than 70 percent over the past 15 years in the Southeast United States through installation of scrubbers on coal-fired power plants, replacement of coal with natural gas, and the use of low-sulfur fuels. Beyond reducing the volume of acidic particles in aerosols, cutting the sulfur emissions has also reduced the deposition of acids in lakes and waterways, noted Armistead "Ted" Russell, a Regent's Professor in Georgia Tech's School of Civil and Environmental Engineering and another of the paper's co-authors. Declining acidity levels in the sulfate particles had been expected to lead to an increase in the production of atmospheric ammonium nitrates. Those particles also have harmful effects, and had they risen to replace the sulfates, further regulatory action might have been required. The continuing high acidity of the sulfate particles has limited ammonium nitrate formation, the researchers believe. "It turns out the nitrate levels have been flat," Russell said. "They haven't changed at all, and this is good news. This also has a strong impact on how nitrogen fertilizes ecosystems, which is important to understanding how the earth's systems respond to pollution." 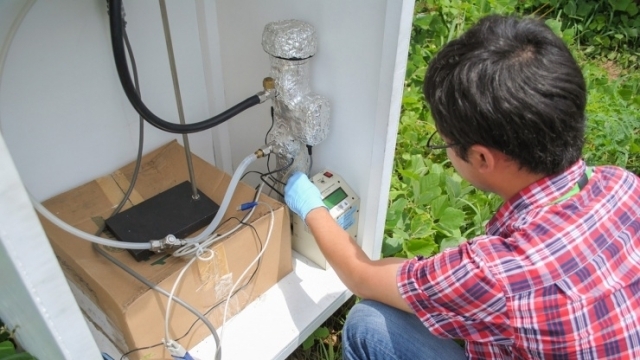 The pH of PM 2.5 particles can't be directly measured, so scientists must infer their acidity by studying the distribution of atmospheric species that can be measured and are highly sensitive to the value of the particle pH. This requires modeling, which can be checked by studying compounds - such as aerosol components and gas-phase components - that can be directly measured. The data was analyzed using the ISORROPIA-II thermodynamic chemistry model, which was developed by one of the co-authors and is widely used in air quality and climate modeling worldwide. The paper's conclusions are based on atmospheric conditions found in the Southeastern United States, and Graduate Research Assistant Hongyu Guo has begun a study of data from the Northeast United States to determine if the same thing happens elsewhere in the country. It is likely that in many parts of the United States - and in the rest of the world - the acidity of sulfate particles remains surprisingly high, Weber said. Beyond the health effects, the acidity of the particles affects other aspect of atmospheric chemistry, including the reaction of isoprene, a natural hydrocarbon produced by trees in forests of many kinds, and the solubility of metals found in mineral dust. "The pH really has a significant effect on many of the processes that affect the overall aerosol mass," Weber added. The research may force a re-examination of the role of acidity in atmospheric chemistry, especially where it affects key processes in climate change models. "I think that this research is going to have a long-term influence on how the community evaluates air quality and climate models, because the pH of particles is so important, yet mostly overlooked," said Athanasios Nenes, a professor and Georgia Power Scholar in the School of Earth & Atmospheric Sciences and the School of Chemical & Biomolecular Engineering and another co-author. "We think there will be a paradigm shift as people re-evaluate what they had intuitively believed about particle pH and how it responds to emissions."